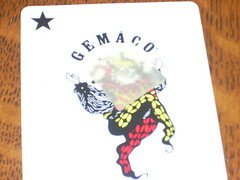 In the middle of this playing card is a color chip of Pardo Translucent. Its just a small chip about 3/4 square, and the thickest setting (7) of my pasta roller. AND its the clearest I have ever seen. I didn't have to do anything tricky like quench it in water, or use a heat gun until it smoked. Just amazed. I like Pardo more and more. I am so gonna make some serious octopus stuff!